Two colorways of self-striping sock yarn and a simple, geometric colorwork pattern create a muted, then suddenly striking, color effects. Victoria Zygas adds demure ruffled ends to the sleek stockinette body of the Murano Scarf (optional, for a unisex accessory). Finished Size: 5-7⁄8” wide and 60” long, blocked. Yarn: Zitron Trekking XXL (75% wool, 25% nylon; 459 yd [422 m]/100 g): #108 rainbow twist (MC) and #112 black/orange twist (CC), 1 ball each. Yarn distributed by Skacel. Needles: Size 000 (1.5 mm): 20” circular (cir). Size 1 (2.5 mm): 16” cir. Adjust needle size if necessary to obtain the correct gauge. Notions: Markers (m); tapestry needle or size B/1 (2.25 mm) crochet hook. There are four selvedge stitches at each edge. 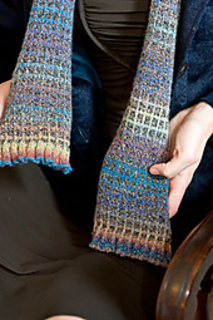 These stitches are worked in reverse stockinette stitch on the ruffles and garter stitch on the body of the scarf. Always slip the first stitch knitwise and purl the last stitch. However, when changing colors at the beginning of a row, bring new color up from behind previous color and knit the first stitch through the back loop (tbl); work remaining three selvedge stitches in pattern (reverse stockinette on ruffles; garter stitch on body). If you do not have enough space to block the entire scarf at once, block it in sections, allowing each section to dry completely before unpinning it and moving on to the next section. Do not block the ruffles.